Past participants of the Prison Arts Project have gone on to host workshops based off the skills they learned from the program. Henry Frank had just arrived at San Quentin State Prison in 2003 when his friend convinced him to sign up for Arts in Corrections. After his friend’s persistence, Frank started attending the morning acrylics class. Frank’s artistry quickly took off. He moved on to block printing and poetry and eventually began teaching alongside the instructors. “On a personal level, it helped me cope with some of my inner struggles and it gave me an outlet to let some of that tension go — through the pen, through the paintbrush, through the glue, whatever it may be,” Frank said. The classes Frank participated in were part of the Prison Arts Project of the William James Association, a program that provides fine arts instruction to marginalized communities, particularly prisoners. Founded in 1977 by local artist Eloise Smith, the program provides long-term visual art and literary classes taught by professional artists. 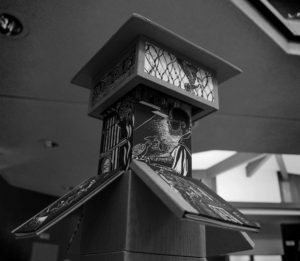 A guard tower made of books filled with artists’ poetry and covered in prints is displayed at the 40th anniversary of the Prison Arts Project. Last Saturday, about 150 returned citizens, or formerly incarcerated individuals, prison art instructors and organizers gathered at Peace United Church of Christ to celebrate the program’s 40th anniversary and overall success. Frank opened the celebration by singing two traditional Native American songs reflective of his culture to give a blessing, promote spiritual healing and honor his time with the program. Steve Emrick, former artist facilitator of the prisons program for 28 years, serves as the community partnership manager at San Quentin State Prison and oversees all the volunteer programs. He said the programs give inmates a chance to explore their ideas and challenge themselves. “I’m not worried about what they did to get in prison or what their past was. I’m working with them now at this point in time. […] The arts are a way to transform that experience,” Emrick said. As students progressed, Emrick said he’s seen improvements in their interactions and behavior both in and out of the class. Since being released, Larry Calderon, a former student of Emrick’s, has started up his own woodworking studio making guitars, jewelry boxes and cigar boxes with the skills he obtained from the program. Calderon believes the program’s effectiveness comes from its open class structure. The anniversary event allowed returned citizens to reunite with former instructors while viewing new pieces of art produced by the program’s participants. Several paintings and block-printed illustrations were displayed on tables to be purchased by donation. 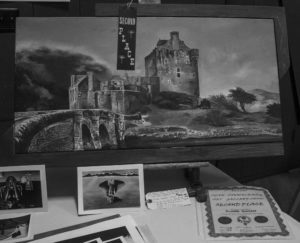 An array of poems illustrating inmates’ experiences and upbringings were set on an easel for attendees to read. A group of about 10 people gathered around one of the displays — a guard tower made of books filled with artists’ poetry and covered in their prints. Katya McCulloch, the instructor in printmaking and drawing with the program at San Quentin State Prison, stood next to the tower admiring the piece with Henry Frank, who is one of the many students she taught since she began instructing in 2004. “I’ve seen hope reawaken — a hope that they can be somebody [other than] the crime they committed, a hope that they might go home,” McCulloch said. Frank said that being in the studio was the first time he was seen as a human being in a long time. He was able to create pieces to send to his parents to let them know he was thinking of them, giving them a glimpse into his life. “Eventually it became a place of safe haven. Walls came down. Class walls. Race walls. It was just being seen as an artist through other inmates and staff alike,” Frank said. Research on the effects of Art in Corrections indicates that participating inmates are less likely to have disciplinary problems while in prison and have a significantly lower rate of recidivism compared to the general parolee population.